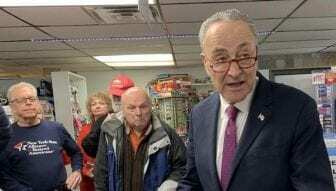 SYRACUSE, NY (WRVO) – U.S. Sen. Chuck Schumer (D-NY) is using the shortage of a vaccine in central New York to showcase the impact of a record long partial government shutdown. Schumer and reporters jammed into the tiny Burnet Pharmacy in Syracuse Monday to talk about shingles, and how the government shutdown is compounding a shingle shot shortage. “This is a glaring example of the shutdown causing real problems,” said Schumer. The shortage of the vaccine that prevents a painful condition called shingles is nothing new. Seniors have been having trouble getting the Shingrix vaccine for months now. But with most of the FDA offices shuttered, the federal government can’t step in and help. Which is why Schumer is asking the FDA to declare the shortage an emergency. “Once they declare it an emergency, they can act as a go-between between Glaxo, the manufacturer, and make sure shipments are given to places that have the shortage,” he said. Schumer, the Senate Minority Leader, has been a pivotal player in the shutdown talks between President Trump and Congress. He said Democrats are open to compromise on the issue of border security, and construction of a wall that’s at the heart of the shutdown. Schumer said he was open to an idea proposed by Sen. Lindsay Graham (R-SC) to reopen the government while negotiations continue. President Trump has said he is still considering declaring a national emergency to provide funding for a wall along the U.S. border with Mexico.